Our Sussex Bowl garden planter is wonderfully HUGE. Starting at 30" wide it is impressive in size and large enough to hold all kinds of plant materials that have short root systems. This pottery has an extra large heavy rolled rim and small circles under the lip and around the base. 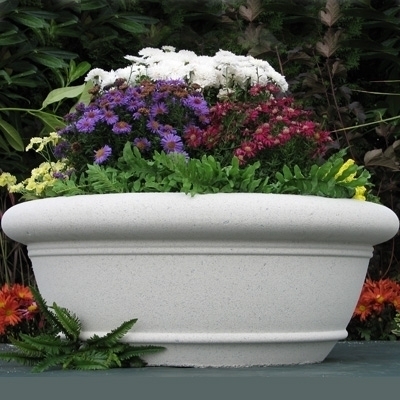 Perfect to display colorful flowers, a palm or succulents, this yard planter does it all. These reconstituted stone containers are hand cast using a dry mix technique that incorporates concrete. Smooth, velvety finish and texture - these planters are truly a piece of art as well as a functioning piece of garden pottery. Used in Europe for centuries, dry cast stone has proven itself to be durable and high-quality pottery. NSB30 $309.00 30.00" 19.00" 12.00"
NSB36 $509.00 36.00" 23.00" 15.00"
NSB42 $883.00 42.00" 26.00" 18.00"
NSB48 $1,231.00 48.00" 30.00" 20.00"